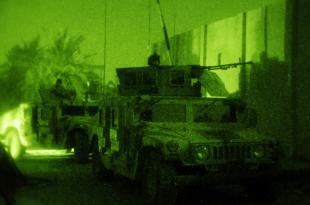 US and Iraqi troops continue to battle the Mahdi Army in Baghdad. Forty-one Mahdi Army fighters were killed in recent clashes in Baghdad and Hussaniyah. Twenty-two were killed in a single engagement as they attack a checkpoint in Baghdad. Most of the Mahdi Army fighters were killed as they attacked checkpoints and patrols during a sandstorm in Baghdad. Mahdi Army fighters used the sandstorm to take advantage of the lack of air cover to attack US and Iraqi positions in eastern and northeastern Baghdad. Helicopters, fighters, and unmanned aerial vehicles were grounded due to lack of visibility. The biggest clash occurred on Sunday after a “large group of criminals” attacked a joint Iraqi and US Army checkpoint in a region in northeastern Baghdad with small-arms fire. 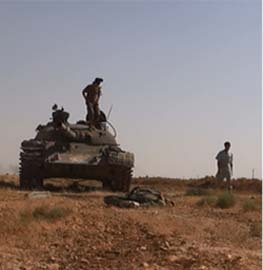 Twenty-two Mahdi Army fighters were killed after the soldiers at the checkpoint returned fire. A US Abrams tank was also involved in the fighting. “The criminals’ small-arms fire was ineffective and there were no U.S. Soldier or ISF [Iraqi Security Forces] casualties in the attack,” Multinational Forces Iraq reported in a press release on the incident. The same day, US soldiers killed 16 Mahdi Army fighters during a series of engagements in northeastern Baghdad. 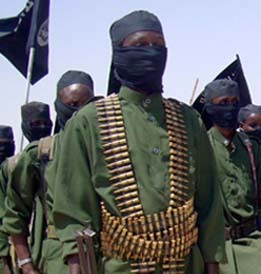 Mahdi Army fighters attacked patrols with small-arms fire and rocket-propelled grenades. 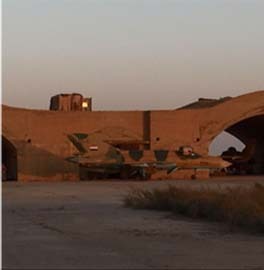 In several instances, Mahdi Army fighters engaged US Abrams tanks, with no effect. No US casualties were reported in the fighting. On April 26, Iraq soldiers from the 37th Iraqi Army Reconnaissance killed three Special Groups fighters in the town of Hussaniyah north of Baghdad. 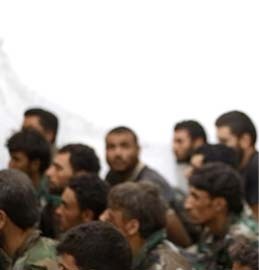 Hussaniyah has been a hotbed of Mahdi Army activity in the recent past, and Iraqi and US troops are conducting operation in the town “to disrupt Special Groups leadership by limiting their ability to coordinate large scale operations against Iraqi and Coalition forces.” Iraqi troops killed nine Mahdi Army fighters in Hussaniyah on April 22. The Mahdi Army has suffered a heavy toll during the fighting over the past eight day since Muqtada al Sadr, the leader of the Mahdi Army, threatened to conduct a third armed uprising. US and Iraqi troops have killed 151 Mahdi Army fighters in northeastern Baghdad since Sadr issued his threat on April 20. Progress of a sort in media reporting. This has to be causing some morale problems in the JAM. On another note, might I suggest that people here write letters to the editor of your local newspaper, and ask why this story was not covered. The Thunder Run has linked to this post in the blog post From the Front: 04/28/2008 News and Personal dispatches from the front lines. Nice goin’, guys. Kill ’em all. This doesn’t sound as far-fetched as it might have 6 months ago. 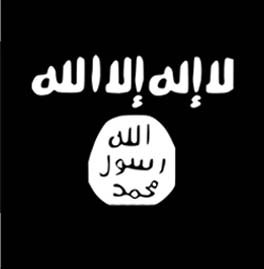 A few days ago, there were two suspiciously coordinated statements emerging from Iraq. Muqtada al-Sadr made open-war threats followed immediately by a similar threat from al-Qaeda. As they say, there is usually no smoke without fire. Respected Iraqi writer and lawyer Suleiman Hakim (a prominent writer regularly published on the leading Iraqi politics and culture website Kitabat ) reported on April 11th -more than a week before Sadr and Abu Ayyub made their threats- about serious negotiations taking place between Sadr’s movement and a leader of the Islamic army group. The meetings, Hakim believes, are taking place in Syria and Lebanon and are sponsored by a special Syrian security apparatus specialized in Iraqi affairs. Iraq the Model: Are Sadr and Al-Qaeda Teaming Up in Iraq? I posted that on an earlier story. Still awaiting word from Bill or DJ if this is valid or not. even better than the npr report mentioned earlier was a story i heard from a bbc reporter on the way home tonight. the basic precept was those clever sadrists launched big attacks over the weekend using the big sandstorm as cover, which blinded the technology dependent americans and iraqis. never did hear how many sadrists got waxed. Bill, can you elaborate on this? What specifically is the EXACT evidence for Iranian tactical command of these battlefields? We are five years into this thing..mortars are coming from ‘somewhere’. We still haven’t trained the IA in “mortars”. Hence…we aren’t supplying the mortars…anything left from the Saddam era has already been spent. Iran has its own homegrown mortars…not a NATO round, not a Warsaw pact round. People who manufactuer military grade exploives aren’t exactly allowed to sell to whoever they feel like…governments oversee this stuff. IA has begun 60 mm mortar training. There are also reports that 8th IAD has begun training on 81 mm mortars. Still, basically agree with SD2’s comments. Had a discussion with friends about JAM’s budget (operational including payroll + equipment.) What would be a good estimate? What expensive equipment and ammunition does JAM require? Matthew, what really matters is how many experienced cadre (including officers) are being injured and killed. I don’t know the answer to that question. Let us also recognize that many “JAM” in Iraq are not fighting. This is good news. We should also remember that the October election results will be critical. I wonder how Muqtada performs. I think he wins between 15% and 30% of the national vote. JAM’s support is in the Shia Arab comunity of Iraq. That is 60% of the population of Iraq. For them to get 15-30% of the national vote would require them to get 25-50% of the Shia Arab vote. JAM is not a large party and it has no pull outside of the shia arab community. There are 275 members of the CoR and JAM currently has 30 seats as part of a deal. And if they keep arms, they will not be on the ballot. The rest of the CoR says so. I do not expect JAM to retain the number of seats they currently have. Actually, they are training the new Divisions on 60mm mortars. They have started the 81mm training (with 8th Div). The local news where I live “reported” that four U.S. soldiers were killed in Iraq yesterday. However they neglected to mention the 48 Mahdi criminals we took out. We are taking some casualties, however this is to be expected since the points of contact have increased substantially over the last month. Once the US/IA has sufficient time to cordon off Sadr City and dismantle the Mahdi command, I’m confident troop casualties will be reduced to pre-April levels, maybe even the lowest levels of the war (I hope). Thanks for pointing out the 4 U.S. deaths was part of the clashes, I thought they had died during mortar attacks on the Green Zone (still part of the overall context of the battle, though) so I didn’t discuss it. That’s some hard fighting there. Some details about the wall being built in Sadr City. U.S. forces are erecting a 10-ft high concrete barrier to control access into and out of southern neighborhoods of Sadr City. The barrier, which when finished will stretch 3 miles, has come under fire from the government of Prime Minister Nouri al-Maliki and from anti-American cleric Muqtada al-Sadr, whose Mahdi Army militia controls much of Baghdad. Chinese-made 107 mm Katyushas have a range of about five miles, while 82 mm mortars can exceed three miles. Much of the Green Zone is more than five miles from firing positions beyond the new wall. 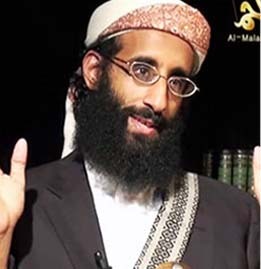 The Mahdi are playing right into US hands-or plans? They will be whipped whenever they engage in force. Theres that many more to eliminate. Good goin’ boys.